140 / curtis + thumb piano from m~fischer on Vimeo. At top, the granular sampling app Curtis captures sound from a thumb piano. Curtis costs justs a dollar, but allows you to sample, then visually manipulate recorded sound, using granular techniques. A “smooth” synthesis engine is upcoming, but I rather like the lo-fi sound — hope you’ll allow us to switch engines with a toggle. As seen at Synthtopia. for an excellent overview of compositional, historical, acoustical, theoretical, musical, and, well, every possible aspect of this influential sonic practice. Have a look at the documentary on Roads and granular music we saw last month. Segue – one early practitioner of granular music was Iannis Xenakis! 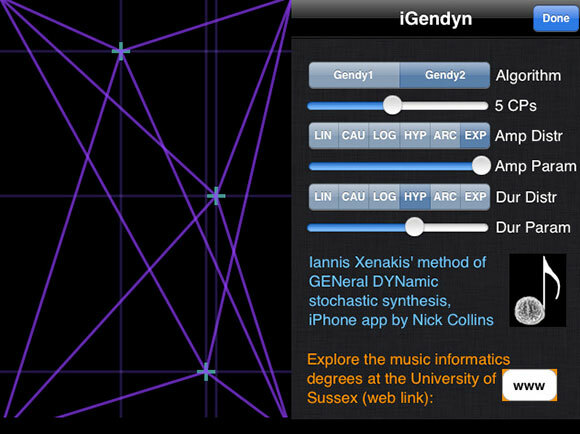 iGendyn is a new, free mobile application built around the GENeral DYNamic stochastic synthesis approach of Xenakis: “Imagine a set of control points (CPs) which together define the shape of a time domain waveform; with each new cycle through this waveform, their relative positions are updated using probabilistic distributions.” And yes, that’s GENDYN as in General Dynamic – not, in fact, a character from The Lord of the Rings. Got that? In the default algorithm, X is amplitude, Y determines how quickly you scan through control points to produce the sound, and tilt changes probability. In other words, whether you understand the underlying approach or not (and hearing is always better, anyway), you can tilt your iPhone around and explore networks of probabilistic sounds. Author Dr. Nick Collins is co-editor of The SuperCollider Book, upcoming from MIT Press, as well as The Cambridge Companion to Electronic Music . Thanks to Raub Roy for the tip! Meanwhile, mother of all synth-geeky iPhone apps finally got its 1.1 update approved, so have a go with Jasuto 1.1 for a really terrific look at what modular synthesis could be. Jasuto also has a desktop VST version and the two will be able to integrate, so you have lots of possibilities here.